As you’ve more than likely noticed, the holiday season is now in full swing, and that means – at least for some folks – that it’s time to don a whole range of ridiculously tasteless clothing, from silly bobble hats through to the traditional gaudy sweater, and Microsoft is apparently poised to release a Windows 95-themed offering when it comes to the latter. According to the firm’s official Windows Twitter account, at some point today, we can expect not a new piece of software, but a new piece of ‘softwear’ – did you see what they did there? 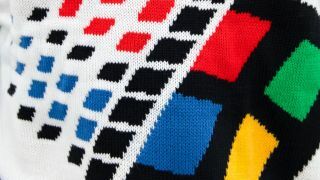 – with an image provided of what looks like a chunky-knit sweater displaying a Windows 95 logo. Whether this will be the only offering, or whether Microsoft is planning a few pieces of clothing themed around 90s nostalgia and its software ecosystem, we shall have to see. Maybe we’ll also get a Microsoft Office 95 scarf decked out in a colorful jigsaw pattern. Or a Microsoft Bob bobble hat. Or maybe we won’t. Only time will tell.